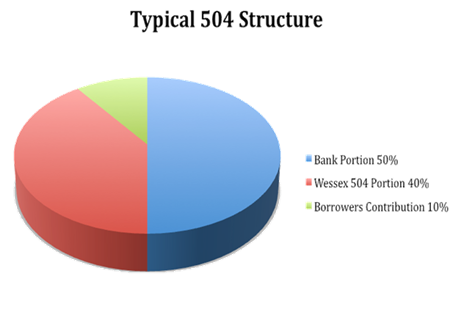 The 504 loan program is designed to assist healthy, growing businesses secure long term, below market, fixed rate financing for the purchase of real estate or capital equipment. Low down payment - The business owner puts only 10% down, borrowing up to 90% of the total financing needs, thus preserving valuable working capital for the business. Long term financing - Repayment periods are longer than conventional bank loans - 20 years fully amortized for real estate loans (10 years for equipment only loans). The borrower's monthly loan payment is more affordable, improving cash flow. Below-market, fixed interest rate -The below market, fixed interest rate protects against future rate fluctuations, providing low and predictable monthly payments. The bank portion of the loan is typically amortized with a minimum term of 10 years up to a maximum of 25 years. Rate term and fees are negotiable between the borrower and bank. The bank is responsible for an SBA first mortgage lender fee, which is 0.50% of the bank loan. The Wessex 504 loan is a 20 year fixed rate loan (10 years for equipment only loans). The interest rate on a 504 loan is based on the current market rate for five-year and ten-year U.S. Treasury issues. All fees are financed into the 504 loan, with the exception of the $2,000 application fee.